The folks who brought you the original Strada Easel back in 2013 are now offering a more compact design called the Strada Mini, and they've asked me to post a review. I've had an opportunity to test the Mini in the field and in short, my impressions are all positive. For more information about the original Strada easel read my review of it here. Pros: Robust design. Excellent build-quality. Compact size. Quick and simple to set up. A pleasure to use. The Mini, like its bigger brother, is a variation of the clamshell easel used by many plein air pros today. 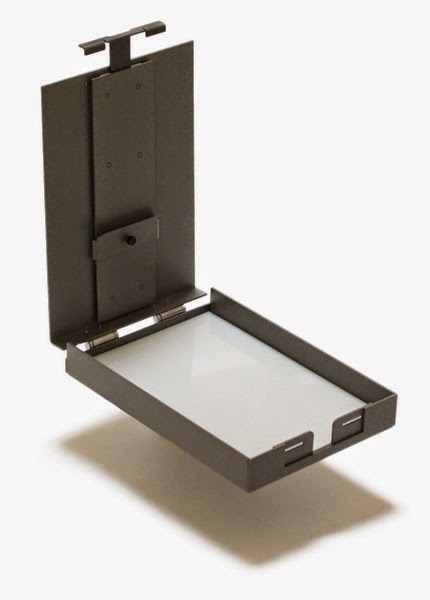 A clamshell design is hinged along the opposite side, opens and closes like a clam, and combines a painting support with a mixing palette immediately below. It is an efficient easel for small to medium sized panel paintings and convenient to set up and tear down out in the field, making it a popular solution for plein air painters. Like its big brother, you attach the Mini to a tripod. (If you want to travel ultra-light you can lay it in your lap or place it on a table top.) You then flip the lid open like a laptop, set a panel or canvas into the t-bar, and start painting. When you are finished you remove the painting, close the lid, push the t-bar back in, and move on. One of the niceties of the Mini is that you can leave excess paint on the palette and the easel will both protect and retard the drying time of that color. I often put the Mini in my freezer, which prevents the paint on the palette from drying out for weeks. Since the easel is made entirely out of aluminum rust is not an issue. The designer and manufacturer of the Mini is a well-recognized plein air painter who spends a lot of time outside painting. He set out to create the easiest to use, robust plein air easel you can imagine, while tempering that goal with making it as light as possible, and reasonably affordable. Towards that end, the Mini is constructed out of a substantial gauge aluminum bent and welded into a strong form, painted in a neutral gray, with some of the sliding parts anodized for durability. The all-important friction hinges consist of stainless steel and any element or form that does not serve a functional purpose has been stripped away, leaving behind an easel free of unnecessary bells and whistles. As previously mentioned, setting up the Mini is as easy as it gets – you attach it to a tripod, pull out the t-bar, flip up the lid, set a canvas or panel in place, and start painting. If you've purchased one or two side shelves like me, you attach them by slipping them on to the rims on either side of the center palette. Set up is easy and quick. 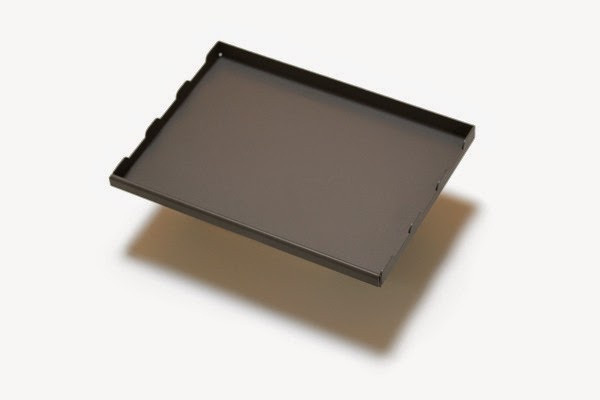 The t-bar mechanism is affixed to the lid and once attached, your painting can be set to any angle you want, from almost fully closed to 180 degrees open. The angle you set is securely held by the two friction hinges at the base of the lid so there are no brass knobs or wing-nuts to fuss with. This is definitely a bonus if you are troubled by a minor arthritis or your hands become cold while you paint. To tear down you simple reverse the process: pull out your painting, close the lid, push the t-bar back in, and detach the Mini. The t-bar will latch the lid closed. It works just like its bigger brother, as an integrated package. There is enough friction built into the hinges to prevent the painting support from excessively wiggling as you work. I (unscientifically) compared the amount of movement of the Mini against the other clam-shell easels I own and found it to be comparable. I wanted to look at this issue closely because I am sensitive to easel movement, yet I was able to quickly adjust to any minor wiggle by lightening up my touch with the brush. In the end, I would favorably compare the bounce of a Mini to painting on a stretched canvas, meaning it feels similar in the give and take. The Mini can hold a canvas or a panel tightly against the lid, although in general I prefer to paint on a rigid supports, not stretched canvas. I was able to fit panels up to 1/4 inch thick, gessoed or lined with cotton or linen, which means your art standard commercial painting supports should be fine. The mini is limited to stretched canvases using a 3/4 inch stretcher bar so deeper 'gallery wrap' canvases won't work. So why choose the Mini over its bigger brother? If you are an avid reader of this blog then you know I am all about the mod. I believe in getting the best gear you can, but also modifying it when necessary. (FWIW, this review is based on a stock Mini I have not modd'ed...yet.) I am not crazy about the plexiglass inserts you are expected to mix on because I know they easily scratched by a palette knife or a razor. This is not a minor point because those scratches fill up with wet paint and thus pollute your lighter tints. The manufacture of the Strada recommends, and even includes, a plastic razor blade for you to try – which I did and immediately put aside – but even if you do limit yourself to plastic razor blades you will still scratch the plexiglass with your palette knife. So the stock plexiglass goes and I will caulk in some high-impact auto glass in its place, or perhaps start mixing directly on the aluminum surface itself. If you decide to stick with plexiglass I recommend you caulk it in place anyway. The double-stick tape provided by the manufacturer didn't hold the plexiglass in place in the cold temperatures I was painting in. I am really pleased that the side shelves nest together and create a separate enclosed shell. This means I can pre-load my palette(s) in the studio, or at the car, and leave a lot of tubed paint behind, lightening the load overall. (You've heard the old backpacker's adage, "Worry about the ounces and the pounds will take care of themselves." Yes? I kid you not, I used to cut my toothbrush in half before heading out on a 7 day trek, so I know it works...) The nested shelves can also protect your leftover paint on the way home, which is another thoughtful consideration by an intelligent designer. However, as the shelves are produced right now, they fit together a tad too tightly and can be difficult to pull apart without a separate tool so I think it is likely crusty paint could glue them together if I am careless. I plan to drill a finger hole in the inner shelf, or weld a hinged ring on the bottom so I can pull the shelves apart if it becomes necessary. In truth, this is a nice problem to have to solve. In any case, both are easy mods to make and something I will discuss with the manufacturer directly. He is responsive to customer suggestions and has already made a number of improvements to his Strada line so I don't see him resting on his laurels now. The Strada Mini is an terrific option for any plein air painter, from the novice who is just starting out, to the advanced artist who has years of experience. It is not often you see such significant and concrete improvements to a time-tested and universal design unless they are achieved by the use of a new material or improved build-quality. 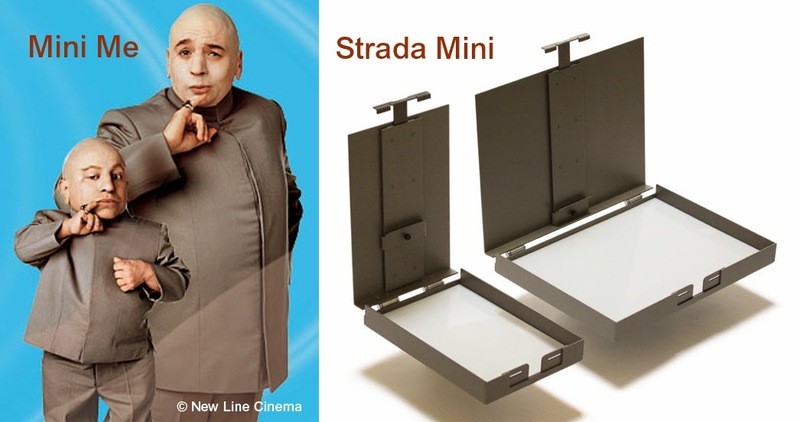 In the case of the Strada Mini, its excellence arises out of three aspects: the aluminum, the bomb-proof build-quality, AND a few real design innovations. Those friction hinges and the self-locking t-bar system make the Mini a pleasure to use.